Posted in: St. Louis Cardinals. Tagged: Boggs, Cardinals, Fernando Salas, Mike Matheny, Mitchell Boggs, National League, Salas. 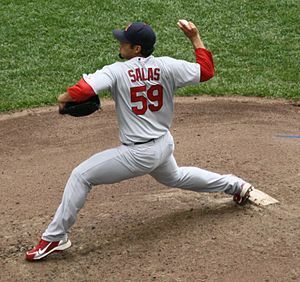 RHP Fernando Salas was added to the 15 day DL today by the Cardinals to make room for Tyler Lyons to join the club and make his MLB debut tonight against the Padres. But this is not about Lyons. I’m with most Cardinals fans in that I scream at the TV every time Salas enters the game. He’s been absolutely awful this season and it’s been masked by the fact that it is inherited runners that he’s allowing to score. Mike Matheny has had some inexplicable infatuation with Salas and Boggs this season that just blows my mind. It got so bad with Boggs that Mozeliak had to step in and do it himself by sending him to Memphis. I don’t understand it. The MLB is performance driven in my mind. There is a high turnover rate from year to year. I haven’t seen the 2011 Salas or the 2012 Boggs yet this season. Okay, SO NOW this “shoulder inflammation” news comes out about Salas. How long has this been going on? I just flash back to the 2012 playoffs when Garcia admitted he was playing hurt. You jeopardize your team when you are selfish like that. Has Salas been pitching with a sore shoulder all season? It just doesn’t make sense to keep going back to guys like Boggs and Salas so they can “get right”. I understand that the Cardinals have a cushion on the NL, but you have young guys like, oh, CARLOS MARTINEZ sitting on the bench doing nothing! Why is he here? I’d rather he be in Springfield condition his small frame to be a starter. ← CARDINALS CALL UP… WAIT… WHO’S TYLER LYONS?